Dugald Livingstone was born in 1898 in Alexandria, a Glasgow suburb, where his dad was a cab driver. He came through Glasgow junior football and signed for Celtic after the Great War but was transferred to Everton in 1920. Five good years at Goodison Park saw him make 95 League appearances at full-back, before he was released to join Plymouth Argyle. After a couple of seasons there and one more at Aberdeen, he finished his playing career at Tranmere, retiring in 1932. Duggie’s first steps on a post-playing career were taken as a trainer at Exeter City. He joined Sheffield United in 1936, working under Teddy Davison, the man he would later succeed at Chesterfield, and remained at The Lane until 1946, when he moved across the city to work with Wednesday. 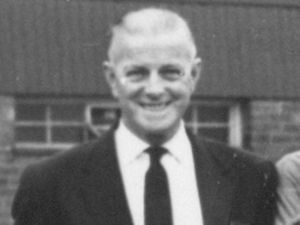 In 1949 Duggie coached Sparta Rottadam, in Holland, and became manager to the Irish national side in 1951. Two years later he was appointed manager of the Belgian national side, and took his side to the 1954 World Cup finals. He returned to England to manage Newcastle United in December 1954 and took a relegation-threatened side to 8th in Division One and an FA Cup final in his first season. If he hadn’t have got them to Wembley, he might have been alright. As it was, Livingstone presented his team sheet to his board before the big game: their response was to screw it into a ball and throw it in the nearest bin. Absent, you see, was the name “Milburn, J.” Livingstone had fallen out with him over the introduction of modern tactics and a squad rotation system. The board picked the team for the final, reinstating the club hero; afterwards, Livingstone was shifted out of the manager’s office, forced to change for work in the referee’s room and told to work with the juniors. Were the board right? Milburn scored within 45 seconds of the kick off and won the Cup, but the Mags, unable to shake off their addiction to the idea of a big centre-forward and traditional wingers, haven’t won major a domestic honour since. Livingstone stuck this humiliation for another six months or so before resigning. Duggie became Fulham’s manager in January 1956 and laid the ground for much of their success in the late 50s and early 60s. His home was in Sheffield, though, and his wife was unable to settle down south, so he declined their offer of a contract extension and accepted the three-year contract laid on the table by Chesterfield in the summer of 1958. Livingstone’s unflappable, happy-go-lucky approach to life was sorely tested in his time at Chesterfield. As at Newcastle, some of his methods were questioned here, too – players were not used to having training sessions supervised by a manager at the back of the main stand, booming instructions through a megaphone – and he was forced to defend unpopular decisions like the sale of Gordon Banks. He undertook a huge cull of the playing staff in 1960 but was unable to bring much quality in by way of replacement, and this was a direct cause of relegation to Division Four in 1961. In February 1962 Livingstone proclaimed that leaving Fulham had been “…the biggest mistake of my life,” and announced that he would leave Saltergate when his contract expired the following May. The football-going public of Chesterfield did not seem overly offended by that statement, perhaps sensing correctly that the rot lay deeper and beyond the manager’s reach. A success as at manager at every club that let him manage, Duggie saw his Spireite side slip from a comfortable Third Division berth to their lowest League place on record when he left for the last time. Of course, the club was on a downward spiral long before he came, and he couldn’t arrest the decline while the financial situation continued to worsen. He didn’t actually make things worse, but the sort of player that the club could afford to recruit perhaps required a simpler style of management than that offered by Livingstone. Like ssome of his predecessors, Livingstone appears not to have worked in football again after leaving The Spireites.